Mobile Cooking Romania and TravelBuzau.com organise the first Truffle Season Opening Event in the forests of Buzau where an abundant culinary programms round about Romanian truffles is waiting for the tourists. Highlight will be a cooking show with Horia Virlan and Jakob Hausmann, both well-known from several Romanian TV shows. The new tourism product Mobile Cooking Romania wants to combine culinary treasures and traditions of the Carpathian garden with spectacular places in Romania. A luxury wood cabin in the middle of the forests of Buzau will be the place for the first Official Truffle Season Opening organised in Romania. Truffles – the diamonds of the haute cuisine – were already used in former centuries in Romanian recipes, but fell completely into oblivion during the last hundred years. Mobile Cooking Romania wants to restore an old tradition and promote culinary tourism in the Carpathian mountains area. The truffle opening event starts with an introduction into the world of truffles and a truffle hunting session with professional hunters from the Romanian Truffle Hunters Association ACTRU. The culinary adventure continues with tasting of wines from Dealu Mare and regional produce of Buzau. A cooking show with the grand chefs Horia Virlan („Cireasa de pe tort”) and Jakob Hausmann („Mica Elvetie”) will show how to prepare traditional and international meals with truffles. Mobile Cooking Romania is an innovative tourism product that combines sightseeing of spectacular places with tasting of culinary treasures of the Carpathian garden. It has been developed by Carpathian Tourism Cluster Romania and several tourism development associations. 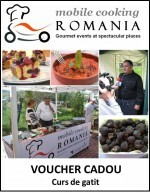 The idea behind “Mobile Cooking Romania” is to attract new tourists with a first-class culinary tourism programme. A special mobile kitchen device and transport system allows offering events at extraordinary places, i.e. medieval cooking experience in castles, fish preparation on a boat in the Danube Delta, cooking with wine in the vineyards of Dealu Mare or outdoor cooking adventures in the forests of Buzau. “Mobile Cooking Romania” includes more than 20 spectacular places in Romania, like Bran castle, Fagaras Fortress, several Saxonian fortified churches or the Living Fire in Lopatari.